From T (1:450) and Z (1:220) up to IIm (1:22,5). Additional libraries include accessories like signals, houses, trees, electric components and symbols for your layouts. But wait, there's even more: A comprehensive collection of slot car systems is included in our app as well as components for many digital system. Up to 99 layers can be created to keep track of your tracks! 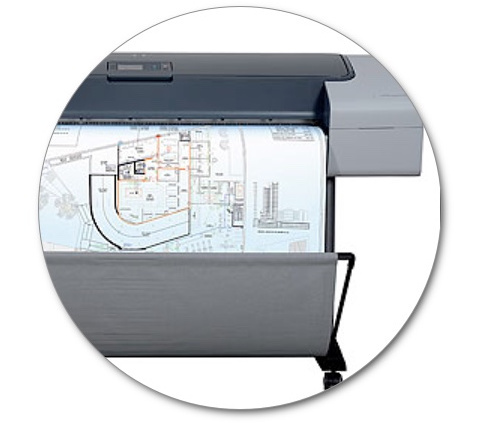 Hiding or locking layers supports you when working with complex layouts. Simply reorder layers using drag & drop, assign descriptive names, duplicate layers - it couldn't be easier. You can optionally specify a default color for new elements or a default height assigned to newly inserted track elements for each individual layer. 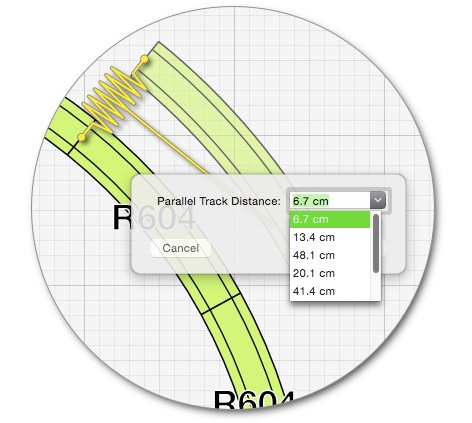 closing gaps with sectional tracks or a fitting piece of flex track. 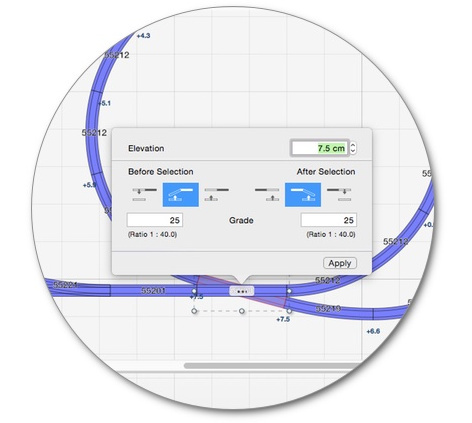 Even tasks like creating a track helix with dozens of tracks only take a few clicks. The assistants are always just one click away in the toolbar of the app! end height for a specific track section. 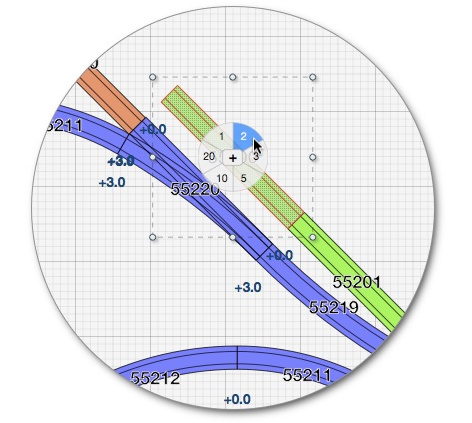 The optional grade profile view of track elements provides a quick overview taking the hassle out of designing complex layouts with different height levels. 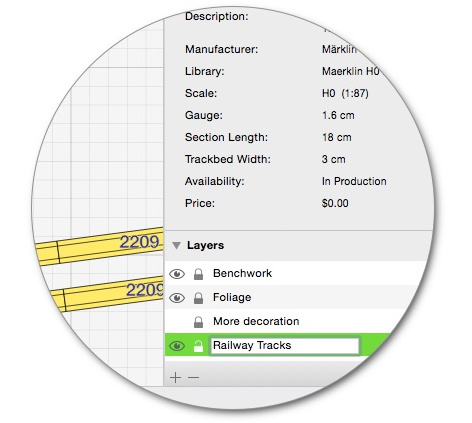 A part list is automatically maintained for every layout providing an overview of the tracks used and the overall costs. Element prices are editable in the part list and RailModeller Pro will maintain a price database making sure costs of elements are kept in synch across all layouts. Layout statistics provide a quick overview of element types & libraries used in your layout. up to 1:1 scale to provide a draft for building your model railroad empire. 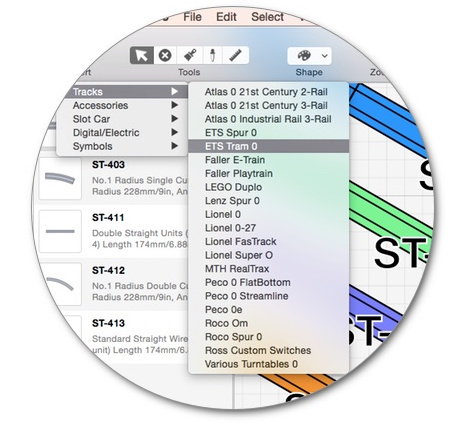 An inventory of tracks can be maintained to display the number of tracks remaining in stock when working on a specific layout or to filter the Parts list to show only tracks that need to be purchased to build the layout. Stocks can be imported from a CSV file as well as exported to CSV for e.g. 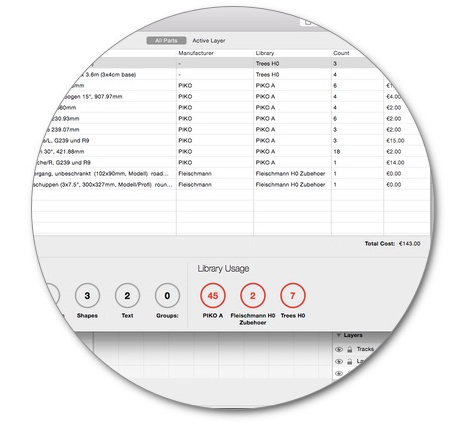 editing the stock with external applications such as Numbers, OpenOffice or Excel. ..and we're just getting started as more features are constantly added!